Big GameDo Multi-Crosshair Scopes Work? The high-tech ballistic-reticle scopes on the market can allow you to shoot at longer ranges — if you can get all the factors to line up. I'm not sure if game is getting harder to find, getting smarter, or just staying farther away from hunters than they did in days gone by, but making longer and longer shots seems to be the buzzword these days — 400, 500, even up to 600 yards and beyond. I once popped a smallish Montana mule deer out of his bed at about 200 yards. Shot one, shooting directly into the blazing sun, was a clean miss, but the race was on. He ran straight into the sun, straight being the operative here, as I sent shots two and three into the dirt at his heels. By this time, I'd broken every self restraint ethic I had, so off went shot four, into the dirt. I had one left, so what the hell. He was running straight up a little hill, showing me only his tail lights, so I brought the crosshairs up through his backbone, held two feet in front of him and he ran into the bullet at about 500 yards. Hold the letters — it was a dumb stunt, I was some decades younger and I’ve never attempted that bonehead shot again. All it could cost me was a bit of ammunition, but it could just as easily cripple and lose a fine trophy. They deserve better. Standing targets, well presented, can be a different story — if all the "ifs" fall into place. 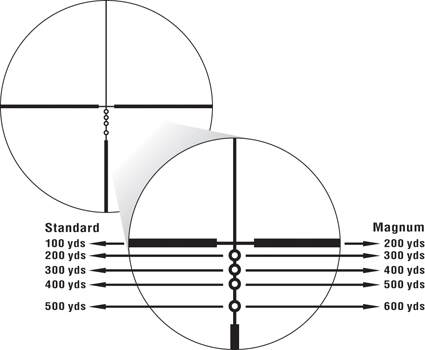 All of the current major riflescope manufacturers have embraced the latest rage in reticle design, employing some variation of a ballistic grid or dot-marked reticles that will allow you to make that long poke a lot more possible. Some use dots, some use grid marks, others use circles or combinations of the above, but all work on the same principle. With the aid of computer programs or printed charts, specific to your bullet caliber, weight and muzzle velocity, the different hash marks indicate bullet impact at various ranges. Do they work? Absolutely — sometimes. Let’s say you're shooting your trusty .30-06 with a 150-grain bullet at a muzzle velocity of 2,900 fps. You sight-in for the primary crosshair to be dead-on at 100 yards and the second hash is then 200. Hold a bit higher, put line three on the target and you’re on at 300 yards. Just keep raising it to different dots, 400 yards or 500, and that puppy’s in the freezer, right? Not so fast. If you're using a scope that has the reticle behind the second focal plane (the way most American scopes are set up) you can't change power level and expect the ballistic drop to still be on. We Americans like that design because the reticle stays the same size when you change power, but it means you must know the power you were on when you set up the drop figures. OK, most hunters set up at max power and crank it up for a long poke, so that's not a super big deal — unless, of course, you happen to have it dialed down. European scopes with the crosshair positioned or etched in the first focal plane don’t suffer this ill. What we dislike about them is that the crosshair gets bigger as you increase power, making a small target that’s far away oftentimes blocked out by a big, fat crosshair. We like the American way, but it does complicate the ballistic reticle. The second if is, you better know the range, exactly, to the target. That means it's standing still, hopefully grazing, and you have the time to drop your binocular and range it. Binoculars with built-in rangefinders are pricey, but they can shave a lot of time off this vital step. Spot it, evaluate it and range it in an instant. Otherwise, it’s look it over carefully with 8 or 10 power, put the binos up, and grab the 6X rangefinder, range it, then set up for the shot. You better hope he’s standing still. Assuming all the ifs are in place, you've made sure you're on the right power and you’ve checked your hash marks, now the ballistic-drop reticles become an asset that's hard to beat. He's at 527, you put your 500-yard mark on the sweet spot, maybe a skosh higher, and squeeze one off. But again, not so fast. What’s the wind doing and how much will it shove your bullet off at that range? 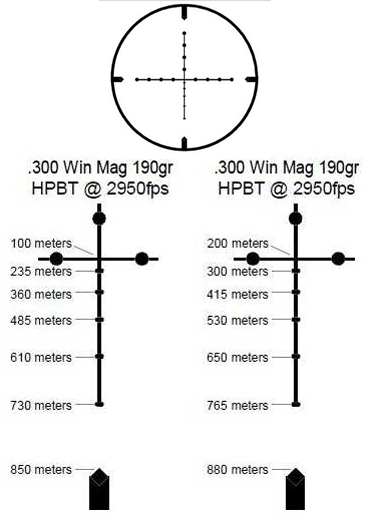 Well, besides the range grids or dots, you will find left and right indicators, circles, dots or hash lines on many ballistic scopes that give you an indication of wind drift for your chosen load, at specific wind speeds. Again, it's on the chart or downloadable. This gets a mite more troublesome because estimating wind speed when hunkered down on a bald knob is an art and skill not many possess. But let's suppose it's not blowing hard enough to blow your hat off, so you take your best guess, hold one grid into the wind, and squeeze. The ballistic reticle provided by all the major manufacturers will give a definite edge. They are precision designs that when matched to proper loads and conditions make the very long shots not just possible, but probable. They were designed for the well-trained sniper, usually with a spotter at their side, helping him or her dope range and wind with practiced precision. Their application to the hunting community is only natural, but long-range precision shooting can’t be taken lightly, even with the high-tech reticle. Put in the range time, burn lots of ammo shooting under field conditions in field positions, until you're comfortable with the range calibrations and your skill level. Range the distance to the target to be absolutely certain of the exact yardage. Ballistic reticles are useless if you don’t know the range. Wait for your buck to give you the right presentation, preferably broadside and standing still. If he’s that far away, you should have plenty of time to wait for the best possible shot. They are truly miracles of design when properly used, and there's a lot of satisfaction that comes from a trophy earned when you've put all the ifs together and made the shot. Oh, wait — did I mention the uphill/downhill factor? Well, that’s fodder for another column.